Not to be confused with Anguilla. 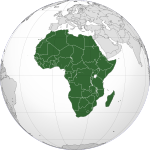 Angola ( /ænˈɡoʊlə/; Portuguese: [ɐ̃ˈɡɔlɐ]), officially the Republic of Angola (Portuguese: República de Angola; Kikongo, Kimbundu and Script error), is a country in Southern Africa. It is the seventh-largest country in Africa, bordered by Namibia to the south, the Democratic Republic of the Congo to the north, Zambia to the east, and the Atlantic Ocean to the west. The exclave province of Cabinda borders the Republic of the Congo and the Democratic Republic of the Congo. The capital and largest city of Angola is Luanda. After a protracted anti-colonial struggle, independence was achieved in 1975 as the Marxist-Leninist People's Republic of Angola, a one-party state supported by the Soviet Union and Cuba. The civil war between the ruling People's Movement for the Liberation of Angola (MPLA) and the insurgent anti-communist National Union for the Total Independence of Angola (UNITA), supported by the United States and apartheid South Africa, lasted until 2002. It has since become a relatively stable unitary presidential republic. Angola has vast mineral and petroleum reserves, and its economy is among the fastest-growing in the world, especially since the end of the civil war; however the standard of living remains low for most of the population, and life expectancy in Angola is among the lowest in the world, while infant mortality is among the highest. Angola's economic growth is highly uneven, with most of the nation's wealth concentrated in a disproportionately small sector of the population. Angola is a member state of the United Nations, OPEC, African Union, the Community of Portuguese Language Countries, and the Southern African Development Community. A highly multiethnic country, Angola's 25.8 million people span tribal groups, customs, and traditions. Angolan culture reflects centuries of Portuguese rule, in the predominance of the Portuguese language and of the Catholic Church. The name Angola comes from the Portuguese colonial name Reino de Angola (Kingdom of Angola), which appeared as early as Dias de Novais's 1571 charter. The toponym was derived by the Portuguese from the title ngola held by the kings of Ndongo. Ndongo in the highlands, between the Kwanza and Lukala Rivers, was nominally a possession of the Kingdom of Kongo, but was seeking greater independence in the 16th century. Modern Angola was populated predominantly by nomadic Khoi and San prior to the first Bantu migrations. The Khoi and San peoples were neither pastoralists nor cultivators, but hunter-gatherers. They were displaced by Bantu peoples arriving from the north, most of whom likely originated in what is today northwestern Nigeria and southern Niger. Bantu speakers introduced the cultivation of bananas and taro, as well as large cattle herds, to Angola's central highlands and the Luanda plain. To its south lay the Kingdom of Ndongo, from which the area of the later Portuguese colony was sometimes known as Dongo. Queen Nzinga in peace negotiations with the Portuguese governor in Luanda, 1657. Portuguese explorer Diogo Cão reached the area in 1484. The previous year, the Portuguese had established relations with the Kongo, which stretched at the time from modern Gabon in the north to the Kwanza River in the south. The Portuguese established their primary early trading post at Soyo, which is now the northernmost city in Angola apart from the Cabinda exclave. Paulo Dias de Novais founded São Paulo de Loanda (Luanda) in 1575 with a hundred families of settlers and four hundred soldiers. Benguela was fortified in 1587 and became a township in 1617. The Portuguese established several other settlements, forts and trading posts along the Angolan coast, principally trading in Angolan slaves for Brazilian plantations. Local slave dealers provided a large number of slaves for the Portuguese Empire, usually in exchange for manufactured goods from Europe. This part of the Atlantic slave trade continued until after Brazil's independence in the 1820s. Despite Portugal's territorial claims in Angola, its control over much of the country's vast interior was minimal. In the 16th century Portugal gained control of the coast through a series of treaties and wars. Life for European colonists was difficult and progress slow. John Iliffe notes that "Portuguese records of Angola from the 16th century show that a great famine occurred on average every seventy years; accompanied by epidemic disease, it might kill one-third or one-half of the population, destroying the demographic growth of a generation and forcing colonists back into the river valleys". During the Portuguese Restoration War, the Dutch West India Company occupied the principal settlement of Luanda in 1641, using alliances with local peoples to carry out attacks against Portuguese holdings elsewhere. A fleet under Salvador de Sá retook Luanda in 1648; reconquest of the rest of the territory was completed by 1650. New treaties with the Kongo were signed in 1649; others with Njinga's Kingdom of Matamba and Ndongo followed in 1656. The conquest of Pungo Andongo in 1671 was the last major Portuguese expansion from Luanda, as attempts to invade Kongo in 1670 and Matamba in 1681 failed. Colonial outposts also expanded inward from Benguela, but until the late 19th century the inroads from Luanda and Benguela were very limited. Hamstrung by a series of political upheavals in the early 1800s, Portugal was slow to mount a large scale annexation of Angolan territory. The slave trade was abolished in Angola in 1836, and in 1854 the colonial government freed all its existing slaves. Four years later, a more progressive administration appointed by Lisbon abolished slavery altogether. However, these decrees remained largely unenforceable, and the Portuguese depended on assistance from the British Royal Navy to enforce their ban on the slave trade. This coincided with a series of renewed military expeditions into the hinterland. By the mid-nineteenth century Portugal had established its dominion as far east as the Congo River and as far south as Mossâmedes. Until the late 1880s, Lisbon entertained proposals to link Angola with its colony in Mozambique but was blocked by British and Belgian opposition. In this period, the Portuguese came up against different forms of armed resistance from various peoples in Angola. The Berlin Conference in 1884–1885 set the colony's borders, delineating the boundaries of Portuguese claims in Angola, although many details were unresolved until the 1920s. Trade between Portugal and her African territories also rapidly increased as a result of protective tariffs, leading to increased development, and a wave of new Portuguese immigrants. Portuguese troops on patrol during the Portuguese Colonial War. Under colonial law, black Angolans were forbidden from forming political parties or labour unions. The first nationalist movements did not take root until after World War II, spearheaded by a largely Westernised, Portuguese-speaking urban class which included many mestiços. During the early 1960s they were joined by other associations stemming from ad hoc labour activism in the rural workforce. Portugal's refusal to address increasing Angolan demands for self-determination provoked an armed conflict which erupted in 1961 with the Baixa de Cassanje revolt and gradually evolved into a protracted war of independence that persisted for the next twelve years. Throughout the conflict, three militant nationalist movements with their own partisan guerrilla wings emerged from the fighting between the Portuguese government and local forces, supported to varying degrees by the Portuguese Communist Party. The National Front for the Liberation of Angola (FNLA) recruited from Bakongo refugees in Zaire. Benefiting from particularly favourable political circumstances in Léopoldville, and especially from a common border with Zaire, Angolan political exiles were able to build up a power base among a large expatriate community from related families, clans, and traditions. People on both sides of the border spoke mutually intelligible dialects and enjoyed shared ties to the historical Kingdom of Kongo. Though as foreigners skilled Angolans could not take advantage of Mobutu Sese Seko's state employment programme, some found work as middlemen for the absentee owners of various lucrative private ventures. The migrants eventually formed the FNLA with the intention of making a bid for political power upon their envisaged return to Angola. A largely Ovimbundu guerrilla initiative against the Portuguese in central Angola from 1966 was spearheaded by Jonas Savimbi and the National Union for the Total Independence of Angola (UNITA). It remained handicapped by its geographic remoteness from friendly borders, the ethnic fragmentation of the Ovimbundu, and the isolation of peasants on European plantations where they had little opportunity to mobilise. During the late 1950s, the rise of the Marxist–Leninist Popular Movement for the Liberation of Angola (MPLA) in the east and Dembos hills north of Luanda came to hold special significance. Formed as a coalition resistance movement by the Angolan Communist Party, the organisation's leadership remained predominantly Ambundu and courted public sector workers in Luanda. Although both the MPLA and its rivals accepted material assistance from the Soviet Union or the People's Republic of China, the former harboured strong anti-imperialist views and was openly critical of the United States and its support for Portugal. This allowed it to win important ground on the diplomatic front, soliciting support from nonaligned governments in Morocco, Ghana, Guinea, Mali, and the United Arab Republic. The MPLA attempted to move its headquarters from Conakry to Léopoldville in October 1961, renewing efforts to create a common front with the FNLA, then known as the Union of Angolan Peoples (UPA) and its leader Holden Roberto. Roberto turned down the offer. When the MPLA first attempted to insert its own insurgents into Angola, the cadres were ambushed and annihilated by UPA partisans on Roberto's orders—setting a precedent for the bitter factional strife which would later ignite the Angolan Civil War. Throughout the war of independence, the three rival nationalist movements were severely hampered by political and military factionalism, as well as their inability to unite guerrilla efforts against the Portuguese. Between 1961 and 1975 the MPLA, UNITA, and the FNLA competed for influence in the Angolan population and the international community. The Soviet Union and Cuba became especially sympathetic towards the MPLA and supplied that party with arms, ammunition, funding, and training. They also backed UNITA militants until it became clear that the latter was at irreconcilable odds with the MPLA. The collapse of Portugal's Estado Novo government following the 1974 Carnation Revolution suspended all Portuguese military activity in Africa and the brokering of a ceasefire pending negotiations for Angolan independence. Encouraged by the Organisation of African Unity, Holden Roberto, Jonas Savimbi, and MPLA chairman Agostinho Neto met in Mombasa in early January 1975 and agreed to form a coalition government. This was ratified by the Alvor Agreement later that month, which called for general elections and set the country's independence date for 11 November 1975. All three factions, however, followed up on the ceasefire by taking advantage of the gradual Portuguese withdrawal to seize various strategic positions, acquire more arms, and enlarge their militant forces. The rapid influx of weapons from numerous external sources, especially the Soviet Union and the United States, as well as the escalation of tensions between the nationalist parties, fueled a new outbreak of hostilities. 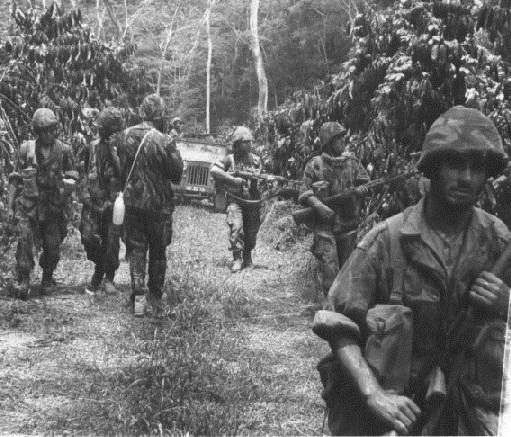 With tacit American and Zairean support the FNLA began massing large numbers of troops in northern Angola in an attempt to gain military superiority. Meanwhile, the MPLA began securing control of Luanda, a traditional Ambundu stronghold. Sporadic violence broke out in Luanda over the next few months after the FNLA attacked MPLA forces in March 1975. The fighting intensified with street clashes in April and May, and UNITA became involved after over two hundred of its members were massacred by an MPLA contingent that June. An upswing in Soviet arms shipments to the MPLA influenced a decision by the Central Intelligence Agency to likewise provide substantial covert aid to the FNLA and UNITA. In August 1975, the MPLA requested direct assistance from the Soviet Union in the form of ground troops. The Soviets declined, offering to send advisers but no troops; however, Cuba was more forthcoming and in late September dispatched nearly five hundred combat personnel to Angola, along with sophisticated weaponry and supplies. By independence there were over a thousand Cuban soldiers in the country. They were kept supplied by a massive airbridge carried out with Soviet aircraft. The persistent buildup of Cuban and Soviet military aid allowed the MPLA to drive its opponents from Luanda and blunt an abortive intervention by Zairean and South African troops, which had deployed in a belated attempt to assist the FNLA and UNITA. The FNLA was largely annihilated, although UNITA managed to withdraw its civil officials and militia from Luanda and seek sanctuary in the southern provinces. From there, Savimbi continued to mount a determined insurgent campaign against the MPLA. An MPLA staff car burns after being destroyed in the fighting outside Novo Redondo (present day Sumbe) in late 1975. Between 1975 and 1991, the MPLA implemented an economic and political system based on the principles of scientific socialism, incorporating central planning and a Marxist–Leninist one-party state. It embarked on an ambitious programme of nationalisation, and the domestic private sector was essentially abolished. Privately owned enterprises were nationalised and incorporated into a single umbrella of state-owned enterprises known as Unidades Economicas Estatais (UEE). Under the MPLA, Angola experienced a significant degree of modern industrialisation. However, corruption and graft also increased and public resources were either allocated inefficiently or simply embezzled by officials for personal enrichment. The ruling party survived an attempted coup d'état by the Maoist-oriented Communist Organisation of Angola (OCA) in 1977, which was suppressed after a series of bloody political purges left thousands of OCA supporters dead. The MPLA abandoned its former Marxist ideology at its third party congress in 1990, and declared social democracy to be its new platform. Angola subsequently became a member of the International Monetary Fund; restrictions on the market economy were also reduced in an attempt to draw foreign investment. By May 1991 it reached a peace agreement with UNITA, the Bicesse Accords, which scheduled new general elections for September 1992. When the MPLA secured a major electoral victory, UNITA objected to the results of both the presidential and legislative vote count and returned to war. Following the election, the Halloween massacre occurred from October 30 to November 1, where MPLA forces killed thousands of UNITA supporters. On 22 March 2002, Jonas Savimbi was killed in action against government troops. UNITA and the MPLA reached a cease-fire shortly afterwards. UNITA gave up its armed wing and assumed the role of a major opposition party. Although the political situation of the country began to stabilise, regular democratic processes did not prevail until the elections in Angola in 2008 and 2012 and the adoption of a new constitution in 2010, all of which strengthened the prevailing dominant-party system. Angola has a serious humanitarian crisis; the result of the prolonged war, of the abundance of minefields, of the continued political (and to a much lesser degree) military activities in favour of the independence of the exclave of Cabinda (carried out in the context of the protracted Cabinda Conflict by the Frente para a Libertação do Enclave de Cabinda, (FLEC)), but most of all, by the depredation of the country's rich mineral resources by the régime. While most of the internally displaced have now settled around the capital, in the so-called musseques, the general situation for Angolans remains desperate. Drought in 2016 caused the worst food crisis in Southern Africa in 25 years. Drought affected 1.4 million people across seven of Angola's 18 provinces. Food prices rose and acute malnutrition rates doubled, with more than 95,000 children affected. Food insecurity was expected to worsen from July to December 2016. At 481,321 sq mi (1,246,620 km2), Angola is the world's twenty-third largest country. It is comparable in size to Mali, or twice the size of France or Texas. It lies mostly between latitudes 4° and 18°S, and longitudes 12° and 24°E. 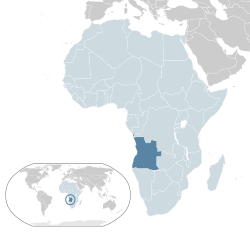 Angola is bordered by Namibia to the south, Zambia to the east, the Democratic Republic of the Congo to the north-east and the South Atlantic Ocean to the west. The coastal exclave of Cabinda in the north, borders the Republic of the Congo to the north, and the Democratic Republic of the Congo to the south. Angola's capital, Luanda, lies on the Atlantic coast in the northwest of the country. Miradouro da Lua on the south coast of Luanda. Angola map of Köppen climate classification. Influence of the Namib Desert in the southwest. South with very high thermal amplitudes due to the proximity of the Kalahari Desert and the influence of masses of tropical air. José Eduardo dos Santos meets with Vladimir Putin. The Angolan government is composed of three branches of government: executive, legislative and judicial. The executive branch of the government is composed of the President, the Vice-Presidents and the Council of Ministers. The legislative branch comprises a 220-seat unicameral legislature elected from both provincial and nationwide constituencies. For decades, political power has been concentrated in the presidency. The Constitution of 2010 establishes the broad outlines of government structure and delineates the rights and duties of citizens. The legal system is based on Portuguese law and customary law but is weak and fragmented, and courts operate in only 12 of more than 140 municipalities. A Supreme Court serves as the appellate tribunal; a Constitutional Court does not hold the powers of judicial review. Governors of the 18 provinces are appointed by the president. After the end of the civil war the regime came under pressure from within as well as from the international community to become more democratic and less authoritarian. Its reaction was to implement a number of changes without substantially changing its character. Angola is classified as 'not free' by Freedom House in the Freedom in the World 2014 report. The report noted that the August 2012 parliamentary elections, in which the ruling Popular Movement for the Liberation of Angola won more than 70% of the vote, suffered from serious flaws, including outdated and inaccurate voter rolls. Voter turnout dropped from 80% in 2008 to 60%. Angola scored poorly on the 2013 Ibrahim Index of African Governance. It was ranked 39 out of 52 sub-Saharan African countries, scoring particularly badly in the areas of participation and human rights, sustainable economic opportunity and human development. The Ibrahim Index uses a number of variables to compile its list which reflects the state of governance in Africa. José Eduardo dos Santos, second President of Angola from 1979 to 2017. On 16 October 2014, Angola was elected for the second time as a non-permanent member of the UN Security Council, with 190 favourable votes out of 193. The mandate began on 1 January 2015 and lasts for two years. Also that month, the country took on the leadership of the African ministers and governors at the International Monetary Fund and the World Bank, following debates at the annual meetings of both entities. Since January 2014 the Republic of Angola has held the rotating presidency of the International Conference on the Great Lakes Region (ICGLR). In 2015, the executive secretary of ICGLR, Ntumba Luaba, called Angola an example to be followed because of the significant progress it made over the 12 years of peace, particularly in terms of socioeconomic and political-military stability. After 38 years of rule, in 2017 President dos Santos stepped down from MPLA leadership. The leader of the winning party at the parliamentary elections in August 2017 become the next president of Angola. The MPLA selected Defense Minister General João Lourenço and won the election. In what has been described as a political purge to cement his power and reduce the influence of the Dos Santos family, Lourenço subsequently sacked the chief of the national police, Ambrósio de Lemos, and the head of the intelligence service, Apolinário José Pereira. Both are considered allies of former president Dos Santos. He also removed Isabel Dos Santos, daughter of the former president, as head of the country's state oil company Sonangol. Angolan Army training in Russia. From left to right, the ranks of the men are Second Lieutenant, First Lieutenant, and Captain. The Angolan Armed Forces (AAF) is headed by a Chief of Staff who reports to the Minister of Defence. There are three divisions—the Army (Exército), Navy (Marinha de Guerra, MGA) and National Air Force (Força Aérea Nacional, FAN). Total manpower is about 110,000. Its equipment includes Russian-manufactured fighters, bombers and transport planes. There are also Brazilian-made EMB-312 Tucanos for training, Czech-made L-39s for training and bombing, and a variety of western-made aircraft such as the C-212\Aviocar, Sud Aviation Alouette III, etc. A small number of AAF personnel are stationed in the Democratic Republic of the Congo (Kinshasa) and the Republic of the Congo (Brazzaville). The National Police departments are Public Order, Criminal Investigation, Traffic and Transport, Investigation and Inspection of Economic Activities, Taxation and Frontier Supervision, Riot Police and the Rapid Intervention Police. The National Police are in the process of standing up an air wing, to provide helicopter support for operations. The National Police are developing their criminal investigation and forensic capabilities. The force has an estimated 6,000 patrol officers, 2,500 taxation and frontier supervision officers, 182 criminal investigators and 100 financial crimes detectives and around 90 economic activity inspectors. The National Police have implemented a modernisation and development plan to increase the capabilities and efficiency of the total force. In addition to administrative reorganisation, modernisation projects include procurement of new vehicles, aircraft and equipment, construction of new police stations and forensic laboratories, restructured training programmes and the replacement of AKM rifles with 9 mm Uzis for officers in urban areas. A Supreme Court serves as a court of appeal. The Constitutional Court is the supreme body of the constitutional jurisdiction, its Organic Law was approved by Law no. 2/08, of June 17, and The legal system is based on Portuguese and customary laws, but it is weak and fragmented. There are only 12 courts in more than 140 counties in the country. With the approval of Law no. 2/08, of June 17 – Organic Law of the Constitutional Court and Law n. 3/08, of June 17 – Organic Law of the Constitutional Process, the Legal Creation of the Constitutional Court. Its first task was the validation of the candidacies of the political parties to the legislative elections of 5 September 2008.Thus, on June 25, 2008, the Constitutional Court was institutionalized and its Judicial Counselors assumed the position before the President of the Republic. Currently, seven advisory judges are present, four men and three women. In 2014, a new penal code took effect in Angola. The classification of money-laundering as a crime is one of the novelties in the new legislation. On 16 October 2014, Angola was elected for the second time a non-permanent member of the United Nations Security Council, with 190 favorable votes out of a total of 193. The term of office begins on 1 January 2015 and lasts for two Years. Since January 2014, the Republic of Angola has been chairing the International Conference for the Great Lakes Region (CIRGL). In 2015, CIRGL Executive Secretary Ntumba Luaba said that Angola is the example to be followed by the members of the organization, due to the significant progress made during the 12 years of peace, namely in terms of socio-economic stability and political- military. Homosexual acts are currently illegal in Angola. However, in February 2017, the Angolan Parliament approved a new penal code which does not outlaw homosexual acts. The law will take effect in late 2017. In 2010, the Angolan Government refused to receive openly gay Isi Yanouka as the new Israeli ambassador, allegedly due to his sexual orientation. With an area of approximately 7,283 square kilometres (2,812 sq mi), the Northern Angolan province of Cabinda is unusual in being separated from the rest of the country by a strip, some 60 kilometres (37 mi) wide, of the Democratic Republic of Congo along the lower Congo River. Cabinda borders the Congo Republic to the north and north-northeast and the DRC to the east and south. The town of Cabinda is the chief population centre. According to a 1995 census, Cabinda had an estimated population of 600,000, approximately 400,000 of whom live in neighbouring countries. Population estimates are, however, highly unreliable. Consisting largely of tropical forest, Cabinda produces hardwoods, coffee, cocoa, crude rubber and palm oil. The product for which it is best known, however, is its oil, which has given it the nickname, "the Kuwait of Africa". Cabinda's petroleum production from its considerable offshore reserves now accounts for more than half of Angola's output. Most of the oil along its coast was discovered under Portuguese rule by the Cabinda Gulf Oil Company (CABGOC) from 1968 onwards. 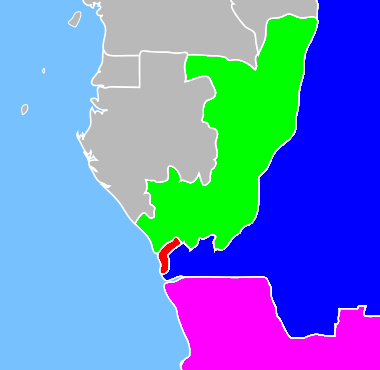 Ever since Portugal handed over sovereignty of its former overseas province of Angola to the local independence groups (MPLA, UNITA and FNLA), the territory of Cabinda has been a focus of separatist guerrilla actions opposing the Government of Angola (which has employed its armed forces, the FAA—Forças Armadas Angolanas) and Cabindan separatists. The Front for the Liberation of the Enclave of Cabinda-Armed Forces of Cabinda (FLEC-FAC) announced a virtual Federal Republic of Cabinda under the Presidency of N'Zita Henriques Tiago. One of the characteristics of the Cabindan independence movement is its constant fragmentation, into smaller and smaller factions. A booming economy due to oil revenues and stable politics, Angola has seen an increase in its international trading sector. The Banco Nacional de Angola building on the Marginal in Luanda dates from 1956. TAAG Angolan Airlines is Angola's national airline. New suburb (new housing area) in Luanda built in 2010. Angola has diamonds, oil, gold, copper and a rich wildlife (dramatically impoverished during the civil war), forest and fossil fuels. Since independence, oil and diamonds have been the most important economic resource. Smallholder and plantation agriculture dramatically dropped in the Angolan Civil War, but began to recover after 2002. The transformation industry of the late colonial period collapsed at independence, because of the exodus of most of the ethnic Portuguese population, but it has begun to re-emerge with updated technologies, partly because of an influx of new Portuguese entrepreneurs. Similar developments have taken place in the service sector. Angola's economy has in recent years moved on from the disarray caused by a quarter-century of Angolan civil war to become the fastest-growing economy in Africa and one of the fastest-growing in the world, with an average GDP growth of 20% between 2005 and 2007. In the period 2001–10, Angola had the world's highest annual average GDP growth, at 11.1%. In 2004, the Exim Bank of China approved a $2 billion line of credit to Angola, to be used for rebuilding Angola's infrastructure, and to limit the influence of the International Monetary Fund there. China is Angola's biggest trade partner and export destination as well as the fourth-largest source of imports. Bilateral trade reached $27.67 billion in 2011, up 11.5% year-on-year. China's imports, mainly crude oil and diamonds, increased 9.1% to $24.89 billion while China's exports to Angola, including mechanical and electrical products, machinery parts and construction materials, surged 38.8%. The oil glut led to a local price for unleaded gasoline of £0.37 a gallon. The Economist reported in 2008 that diamonds and oil make up 60% of Angola's economy, almost all of the country's revenue and all of its dominant exports. Growth is almost entirely driven by rising oil production which surpassed 1.4 million barrels per day (220,000 m3/d) in late 2005 and was expected to grow to 2 million barrels per day (320,000 m3/d) by 2007. Control of the oil industry is consolidated in Sonangol Group, a conglomerate owned by the Angolan government. In December 2006, Angola was admitted as a member of OPEC. Operations in its diamond mines include partnerships between state-run Endiama and mining companies such as ALROSA which operate in Angola. The Angolan economy grew 18% in 2005, 26% in 2006 and 17.6% in 2007. Due to the global recession the economy contracted an estimated −0.3% in 2009. The security brought about by the 2002 peace settlement has allowed the resettlement of 4 million displaced persons and a resulting large-scale increases in agriculture production. Although the country's economy has grown significantly since Angola achieved political stability in 2002, mainly due to fast-rising earnings in the oil sector, Angola faces huge social and economic problems. These are in part a result of almost continual armed conflict from 1961 on, although the highest level of destruction and socio-economic damage took place after the 1975 independence, during the long years of civil war. However, high poverty rates and blatant social inequality chiefly stem from persistent authoritarianism, "neo-patrimonial" practices at all levels of the political, administrative, military and economic structures, and of a pervasive corruption. The main beneficiaries are political, administrative, economic and military power holders, who have accumulated (and continue to accumulate) enormous wealth. "Secondary beneficiaries" are the middle strata which are about to become social classes. However, almost half the population has to be considered poor, with dramatic differences between the countryside and the cities (where by now slightly more than 50% of the people live). A study carried out in 2008 by the Angolan Instituto Nacional de Estatística found that in rural areas roughly 58% must be classified as "poor" according to UN norms, but in the urban areas only 19%, and an overall rate of 37%. In cities, a majority of families, well beyond those officially classified as poor, must adopt a variety of survival strategies. In urban areas social inequality is most evident and it's extreme in Luanda. In the Human Development Index Angola constantly ranks in the bottom group. Growing oil revenues also created opportunities for corruption: according to a recent Human Rights Watch report, 32 billion US dollars disappeared from government accounts in 2007–2010. Furthermore, Sonangol, the state-run oil company, controls 51% of Cabinda’s oil. Due to this market control the company ends up determining the profit received by the government and the taxes it pays. The council of foreign affairs states that the World Bank mentioned that Sonangol " is a taxpayer, it carries out quasi-fiscal activities, it invests public funds, and, as concessionaire, it is a sector regulator. This multifarious work programme creates conflicts of interest and characterises a complex relationship between Sonangol and the government that weakens the formal budgetary process and creates uncertainty as regards the actual fiscal stance of the state." Before independence in 1975, Angola was a breadbasket of southern Africa and a major exporter of bananas, coffee and sisal, but three decades of civil war (1975–2002) destroyed fertile countryside, left it littered with landmines and drove millions into the cities. The country now depends on expensive food imports, mainly from South Africa and Portugal, while more than 90% of farming is done at the family and subsistence level. Thousands of Angolan small-scale farmers are trapped in poverty. The enormous differences between the regions pose a serious structural problem for the Angolan economy, illustrated by the fact that about one third of economic activities are concentrated in Luanda and neighbouring Bengo province, while several areas of the interior suffer economic stagnation and even regression. One of the economic consequences of the social and regional disparities is a sharp increase in Angolan private investments abroad. The small fringe of Angolan society where most of the asset accumulation takes place seeks to spread its assets, for reasons of security and profit. For the time being, the biggest share of these investments is concentrated in Portugal where the Angolan presence (including the family of the state president) in banks as well as in the domains of energy, telecommunications, and mass media has become notable, as has the acquisition of vineyards and orchards as well as of touristic enterprises. Sub-Saharan Africa nations are globally achieving impressive improvements in well-being, according to a report by Tony Blair's Africa Governance Initiative and the Boston Consulting Group. Angola has upgraded critical infrastructure, an investment made possible by funds from the nation's development of oil resources. According to this report, just slightly more than ten years after the end of the civil war Angola's standard of living has overall greatly improved. Life expectancy, which was just 46 years in 2002, reached 51 in 2011. Mortality rates for children fell from 25 percent in 2001 to 19 percent in 2010 and the number of students enrolled in primary school has tripled since 2001. However, at the same time the social and economic inequality that has characterised the country since long has not diminished, but on the contrary deepened in all respects. With a stock of assets corresponding to 70 billion Kz (6.8 billion USD), Angola is now the third largest financial market in sub-Saharan Africa, surpassed only by Nigeria and South Africa. According to the Angolan Minister of Economy, Abraão Gourgel, the financial market of the country grew modestly from 2002 and now lies in third place at the level of sub-Saharan Africa. Angola's economy is expected to grow by 3.9 percent in 2014 said the International Monetary Fund (IMF), robust growth in the non-oil economy, mainly driven by a very good performance in the agricultural sector, is expected to offset a temporary drop in oil production. Angola's financial system is maintained by the National Bank of Angola and managed by governor Jose de Lima Massano. According to a study on the banking sector, carried out by Deloitte, the monetary policy led by Banco Nacional de Angola (BNA), the Angolan national bank, allowed a decrease in the inflation rate put at 7.96% in December 2013, which contributed to the sector's growth trend. Estimates released by Angola's central bank, said country's economy should grow at an annual average rate of 5 percent over the next four years, boosted by the increasing participation of the private sector. On 19 December 2014, the Capital Market in Angola started. BODIVA (Angola Securities and Debt Stock Exchange, in English) received the secondary public debt market, and it is expected to start the corporate debt market by 2015, but the stock market should be a reality only in 2016. Agriculture and forestry is an area of opportunity for the country. “Angola requires 4.5 million tonnes a year of grain but grows only about 55% of the corn it needs, 20% of the rice and just 5% of its required wheat”(African economic Outlook) but “less than 3 percent of Angola's abundant fertile land is cultivated and the economic potential of the forestry sector remains largely unexploited” (World Bank). Quatro de Fevereiro Luanda Airport arrivals. Ship loading minerals at Namibe harbour, Angola. 243 airports, of which 32 are paved. Travel on highways outside of towns and cities in Angola (and in some cases within) is often not best advised for those without four-by-four vehicles. While a reasonable road infrastructure has existed within Angola, time and the war have taken their toll on the road surfaces, leaving many severely potholed, littered with broken asphalt. In many areas drivers have established alternate tracks to avoid the worst parts of the surface, although careful attention must be paid to the presence or absence of landmine warning markers by the side of the road. The Angolan government has contracted the restoration of many of the country's roads. The road between Lubango and Namibe, for example, was completed recently with funding from the European Union, and is comparable to many European main routes. Completing the road infrastructure is likely to take some decades, but substantial efforts are already being made. Transport is an important aspect in Angola because it is strategically located and it could become a regional logistics hub. In addition Angola has some of the most important and biggest ports and so it is vital to connect them to the interior of the country as well as to neighbouring countries. Tourism is restarting on the heels of the long ended stop in the civil war, and very few tourists venture anywhere in Angola yet due to lack of infrastructure. The telecommunications industry is considered one of the main strategic sectors in Angola. In October 2014, the building of an optic fiber underwater cable was announced. This project aims to turn Angola into a continental hub, thus improving Internet connections both nationally and internationally. On 11 March 2015, the First Angolan Forum of Telecommunications and Information Technology was held in Luanda under the motto "The challenges of telecommunications in the current context of Angola", to promote debate on topical issues on telecommunications in Angola and worldwide. A study of this sector, presented at the forum, said Angola had the first telecommunications operator in Africa to test LTE – with speeds up to 400Mbit/s – and mobile penetration of about 75%; there are about 3.5 million smartphone in the Angolan market; There are about 25,000 kilometres (16,000 miles) of optical fibre installed in the country. The first Angolan satellite, AngoSat-1, will be ready for launch into orbit in 2017 and ensure telecommunications throughout the country. According to Aristides Safeca, Secretary of State for Telecommunications, the satellite will provide telecommunications services, TV, internet and e-government and will remain into orbit "at best" for 18 years. The management of the top-level domain '.ao' will pass from Portugal to Angola in 2015, following new legislation. A joint decree of minister of Telecommunications and Information Technologies José Carvalho da Rocha and the minister of Science and Technology, Maria Cândida Pereira Teixeira, states that "under the massification" of that Angolan domain, "conditions are created for the transfer of the domain root '.ao' of Portugal to Angola". Angola has a population of 24,383,301 inhabitants according to the preliminary results of its 2014 census, the first one conducted or carried out since 15 December 1970. It is composed of Ovimbundu (language Umbundu) 37%, Ambundu (language Kimbundu) 23%, Bakongo 13%, and 32% other ethnic groups (including the Chokwe, the Ovambo, the Ganguela and the Xindonga) as well as about 2% mestiços (mixed European and African), 1.6% Chinese and 1% European. The Ambundu and Ovimbundu ethnic groups combined form a majority of the population, at 62%. The population is forecast to grow to over 60 million people to 2050, 2.7 times the 2014 population. However, on 23 March 2016, official data revealed by Angola's National Statistic Institute – Instituto Nacional de Estatística (INE), states that Angola has a population of 25.789.024 inhabitants. It is estimated that Angola was host to 12,100 refugees and 2,900 asylum seekers by the end of 2007. 11,400 of those refugees were originally from the Democratic Republic of Congo, who arrived in the 1970s. As of 2008 there were an estimated 400,000 Democratic Republic of the Congo migrant workers, at least 220,000 Portuguese, and about 259,000 Chinese living in Angola. Since 2003, more than 400,000 Congolese migrants have been expelled from Angola. Prior to independence in 1975, Angola had a community of approximately 350,000 Portuguese, but the vast majority left after independence and the ensuing civil war. However, Angola has recovered its Portuguese minority in recent years; currently, there are about 200,000 registered with the consulates, and increasing due to the debt crisis in Portugal and the relative prosperity in Angola. The Chinese population stands at 258,920, mostly composed of temporary migrants. Also, there is a small Brazilian community of about 5,000 people. The total fertility rate of Angola is 5.54 children born per woman (2012 estimates), the 11th highest in the world. The languages in Angola are those originally spoken by the different ethnic groups and Portuguese, introduced during the Portuguese colonial era. The most widely spoken indigenous languages are Umbundu, Kimbundu and Kikongo, in that order. Portuguese is the official language of the country. Although the exact numbers of those fluent in Portuguese or who speak Portuguese as a first language are unknown, a 2012 study mentions that Portuguese is the first language of 39% of the population. In 2014, a census carried out by the Instituto Nacional de Estatística in Angola mentions that 71.15% of the nearly 25.8 million inhabitants of Angola (meaning around 18.3 million people) use Portuguese as a first or second language. There are about 1,000 religious communities, mostly Christian, in Angola. While reliable statistics are nonexistent, estimates have it that more than half of the population are Catholics, while about a quarter adhere to the Protestant churches introduced during the colonial period: the Congregationalists mainly among the Ovimbundu of the Central Highlands and the coastal region to its west, the Methodists concentrating on the Kimbundu speaking strip from Luanda to Malanje, the Baptists almost exclusively among the Bakongo of the north-west (now present in Luanda as well) and dispersed Adventists, Reformed and Lutherans. In Luanda and region there subsists a nucleus of the "syncretic" Tocoists and in the north-west a sprinkling of Kimbanguism can be found, spreading from the Congo/Zaïre. Since independence, hundreds of Pentecostal and similar communities have sprung up in the cities, where by now about 50% of the population is living; several of these communities/churches are of Brazilian origin. As of 2008 the U.S. Department of State estimates the Muslim population at 80,000–90,000, less than 1% of the population, while the Islamic Community of Angola puts the figure closer to 500,000. Muslims consist largely of migrants from West Africa and the Middle East (especially Lebanon), although some are local converts. The Angolan government does not legally recognize any Muslim organizations and often shuts down mosques or prevents their construction. In a study assessing nations' levels of religious regulation and persecution with scores ranging from 0 to 10 where 0 represented low levels of regulation or persecution, Angola was scored 0.8 on Government Regulation of Religion, 4.0 on Social Regulation of Religion, 0 on Government Favoritism of Religion and 0 on Religious Persecution. Foreign missionaries were very active prior to independence in 1975, although since the beginning of the anti-colonial fight in 1961 the Portuguese colonial authorities expelled a series of Protestant missionaries and closed mission stations based on the belief that the missionaries were inciting pro-independence sentiments. Missionaries have been able to return to the country since the early 1990s, although security conditions due to the civil war have prevented them until 2002 from restoring many of their former inland mission stations. The Catholic Church and some major Protestant denominations mostly keep to themselves in contrast to the "New Churches" which actively proselytize. Catholics, as well as some major Protestant denominations, provide help for the poor in the form of crop seeds, farm animals, medical care and education. The substrate of Angolan culture is African, predominantly Bantu, while Portuguese culture has had a significant impact, specifically in terms of language and religion. The diverse ethnic communities – the Ovimbundu, Ambundu, Bakongo, Chokwe, Mbunda and other peoples – to varying degrees maintain their own cultural traits, traditions and languages, but in the cities, where slightly more than half of the population now lives, a mixed culture has been emerging since colonial times; in Luanda, since its foundation in the 16th century. In this urban culture, the Portuguese heritage has become more and more dominant. African roots are evident in music and dance, and is moulding the way in which Portuguese is spoken. This process is well reflected in contemporary Angolan literature, especially in the works of Angolan authors. In 2014, Angola resumed the National Festival of Angolan Culture after a 25-year break. The festival took place in all the provincial capitals and lasted for 20 days, with the theme Culture as a Factor of Peace and Development. Epidemics of cholera, malaria, rabies and African hemorrhagic fevers like Marburg hemorrhagic fever, are common diseases in several parts of the country. Many regions in this country have high incidence rates of tuberculosis and high HIV prevalence rates. Dengue, filariasis, leishmaniasis and onchocerciasis (river blindness) are other diseases carried by insects that also occur in the region. Angola has one of the highest infant mortality rates in the world and one of the world's lowest life expectancies. A 2007 survey concluded that low and deficient niacin status was common in Angola. Demographic and Health Surveys is currently conducting several surveys in Angola on malaria, domestic violence and more. In September 2014, the Angolan Institute for Cancer Control (IACC) was created by presidential decree, and it will integrate the National Health Service in Angola. The purpose of this new centre is to ensure health and medical care in oncology, policy implementation, programmes and plans for prevention and specialised treatment. This cancer institute will be assumed as a reference institution in the central and southern regions of Africa. In 2014, Angola launched a national campaign of vaccination against measles, extended to every child under ten years old and aiming to go to all 18 provinces in the country. The measure is part of the Strategic Plan for the Elimination of Measles 2014–2020 created by the Angolan Ministry of Health which includes strengthening routine immunisation, a proper dealing with measles cases, national campaigns, introducing a second dose of vaccination in the national routine vaccination calendar and active epidemiological surveillance for measles. This campaign took place together with the vaccination against polio and vitamin A supplementation. A yellow fever outbreak, the worst in the country in three decades began in December 2015. By August 2016, when the outbreak began to subside, nearly 4,000 people were suspected of being infected. As many as 369 may have died. The outbreak began in the capital, Luanda, and spread to at least 16 of the 18 provinces. Although by law education in Angola is compulsory and free for eight years, the government reports that a percentage of pupils are not attending due to a lack of school buildings and teachers. Pupils are often responsible for paying additional school-related expenses, including fees for books and supplies. In 1999, the gross primary enrollment rate was 74 percent and in 1998, the most recent year for which data are available, the net primary enrollment rate was 61 percent. Gross and net enrollment ratios are based on the number of pupils formally registered in primary school and therefore do not necessarily reflect actual school attendance. There continue to be significant disparities in enrollment between rural and urban areas. In 1995, 71.2 percent of children ages 7 to 14 years were attending school. It is reported that higher percentages of boys attend school than girls. During the Angolan Civil War (1975–2002), nearly half of all schools were reportedly looted and destroyed, leading to current problems with overcrowding. The Ministry of Education recruited 20,000 new teachers in 2005 and continued to implement teacher trainings. Teachers tend to be underpaid, inadequately trained and overworked (sometimes teaching two or three shifts a day). Some teachers may reportedly demand payment or bribes directly from their pupils. Other factors, such as the presence of landmines, lack of resources and identity papers, and poor health prevent children from regularly attending school. Although budgetary allocations for education were increased in 2004, the education system in Angola continues to be extremely under-funded. According to estimates by the UNESCO Institute for Statistics, the adult literacy rate in 2011 was 70.4%. By 2015, this had increased to 71.1%. 82.9% of males and 54.2% of women are literate as of 2001. Since independence from Portugal in 1975, a number of Angolan students continued to be admitted every year at high schools, polytechnical institutes and universities in Portugal, Brazil and Cuba through bilateral agreements; in general, these students belong to the elites. In September 2014, the Angolan Ministry of Education announced an investment of 16 million Euros in the computerisation of over 300 classrooms across the country. The project also includes training teachers at a national level, "as a way to introduce and use new information technologies in primary schools, thus reflecting an improvement in the quality of teaching." In 2010, the Angolan government started building the Angolan Media Libraries Network, distributed throughout several provinces in the country to facilitate the people's access to information and knowledge. Each site has a bibliographic archive, multimedia resources and computers with Internet access, as well as areas for reading, researching and socialising. The plan envisages the establishment of one media library in each Angolan province by 2017. The project also includes the implementation of several media libraries, in order to provide the several contents available in the fixed media libraries to the most isolated populations in the country. At this time, the mobile media libraries are already operating in the provinces of Luanda, Malanje, Uíge, Cabinda and Lunda South. As for REMA, the provinces of Luanda, Benguela, Lubango and Soyo have currently working media libraries. Basketball is the most popular sport in Angola. Its national team has won the AfroBasket 11 times and holds the record of most titles. As a top team in Africa, it's a regular competitor at the Summer Olympic Games and the FIBA World Cup. In football, Angola hosted the 2010 Africa Cup of Nations. The Angola national football team qualified for the 2006 FIFA World Cup, as this was their first appearance on the World Cup finals stage. They were eliminated after one defeat and two draws in the group stage. They won 3 COSAFA Cups and finished runner up in 2011 African Nations Championship. Angola has participated in the World Women's Handball Championship for several years. The country has also appeared in the Summer Olympics for seven years and both regularly competes in and once has hosted the FIRS Roller Hockey World Cup, where the best finish is sixth. Angola is also often believed to have historic roots in the martial art "Capoeira Angola" and "Batuque" which were practiced by enslaved African Angolans transported as part of the Atlantic slave trade. ^ a b c d "Report for Selected Countries and Subjects: Angola". International Monetary Fund. http://www.imf.org/external/pubs/ft/weo/2015/02/weodata/weorept.aspx?sy=2018&ey=2020&scsm=1&ssd=1&sort=country&ds=.&br=1&pr1.x=67&pr1.y=1&c=614%2C674%2C678%2C688%2C728%2C694%2C662%2C199%2C734%2C738%2C746%2C754&s=NGDPD%2CNGDPDPC%2CPPPGDP%2CPPPPC&grp=0&a=. ^ "Gini Index". World Bank. Archived from the original on 9 February 2015. https://web.archive.org/web/20150209003326/http://data.worldbank.org/indicator/SI.POV.GINI. Retrieved 2 March 2011. ^ "2016 Human Development Report". United Nations Development Programme. 2016. http://hdr.undp.org/sites/default/files/2016_human_development_report.pdf. Retrieved 21 March 2017. ^ "Life expectancy at birth". World Fact Book. United States Central Intelligence Agency. 2014. https://www.cia.gov/library/publications/the-world-factbook/rankorder/2102rank.html. ^ "Transparency and Accountability in Angola". https://www.hrw.org/report/2010/04/13/transparency-and-accountability-angola. ^ Henderson, Lawrence (1979). Angola: Five Centuries of Conflict. Ithaca: Cornell University Press. pp. 40–42. ISBN 978-0812216202. ^ Miller, Josep h (1979). 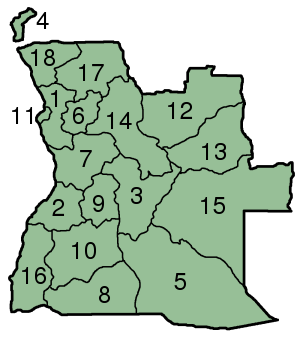 Kings and Kinsmen: Early Mbundu States in Angola. Ithaca: Cornell University Press. pp. 55–56. ISBN 978-0198227045. ^ "The Story of Africa". BBC. http://www.bbc.co.uk/worldservice/specials/1624_story_of_africa/page45.shtml. Retrieved 27 June 2010. ^ Fleisch, Axel (2004). "Angola: Slave Trade, Abolition of". In Shillington, Kevin. Encyclopedia of African History 3-Volume Set. 1. Routledge. pp. 131–133. ISBN 1-57958-245-1. ^ Global Investment and Business Center (1 January 2006). Angola in the Eighteenth Century: Slave trading in the 1700s. Int'l Business Publications. p. 153. ISBN 0739716069. ^ World Bank. The History of Brazil–Africa Relations. p. 27. http://siteresources.worldbank.org/AFRICAEXT/Resources/africa-brazil-bridging-chapter2.pdf. Retrieved 14 May 2016. ^ a b c d e f Collelo, Thomas, ed (1991). Angola, a Country Study. Area Handbook Series (Third ed.). Washington, D.C.: Department of the Army, American University. pp. 14–26. ISBN 978-0160308444. ^ a b c Corrado, Jacopo (2008). The Creole Elite and the Rise of Angolan Protonationalism: 1870–1920. Amherst, New York: Cambria Press. pp. 11–13. ISBN 978-1604975291. ^ a b Okoth, Assa (2006). A History of Africa: African nationalism and the de-colonisation process. Nairobi: East African Educational Publishers. pp. 143–147. ISBN 9966-25-358-0. ^ a b Dowden, Richard (2010). Africa: Altered States, Ordinary Miracles. London: Portobello Books. pp. 207–208. ISBN 978-1-58648-753-9. ^ a b c d e Cornwell, Richard (1 November 2000). "The War of Independence". Pretoria: Institute for Security Studies. http://www.issafrica.org/pubs/books/Angola/4cornwell.pdf. Retrieved 20 February 2015. ^ a b Stockwell, John (1979) . In Search Of Enemies. London: Futura Publications Limited. pp. 44–45. ISBN 978-0393009262. ^ a b c Hanlon, Joseph (1986). Beggar Your Neighbours: Apartheid Power in Southern Africa. Bloomington: Indiana University Press. p. 155. ISBN 978-0253331311. ^ a b c d Chabal, Patrick (2002). A History of Postcolonial Lusophone Africa. Bloomington: Indiana University Press. p. 142. ISBN 978-0253215659. ^ a b c d e f g Rothschild, Donald (1997). Managing Ethnic Conflict in Africa: Pressures and Incentives for Cooperation. Washington: The Brookings Institution. pp. 115–120. ISBN 978-0815775935. ^ a b Domínguez, Jorge (1989). To Make a World Safe for Revolution: Cuba's Foreign Policy. Cambridge: Harvard University Press. pp. 131–133. ISBN 978-0674893252. ^ a b c d e f g Weigert, Stephen (2011). Angola: A Modern Military History. Basingstoke: Palgrave-Macmillan. pp. 56–65. ISBN 978-0230117778. ^ a b c d e Vanneman, Peter (1990). Soviet Strategy in Southern Africa: Gorbachev's Pragmatic Approach. Stanford: Hoover Institution Press. pp. 48–49. ISBN 978-0817989026. ^ a b c d Ferreira, Manuel (2002). Arming the South: The Economics of Military Expenditure, Arms Production and Arms Trade in Developing Countries. Basingstoke: Palgrave-Macmillan. pp. 251–255. ISBN 978-0-230-50125-6. ^ Akongdit, Addis Ababa Othow (2013). Impact of Political Stability on Economic Development: Case of South Sudan. Bloomington: AuthorHouse Ltd, Publishers. pp. 74–75. ISBN 978-1491876442. ^ a b Tucker, Spencer (2013). Encyclopedia of Insurgency and Counterinsurgency: A New Era of Modern Warfare. Santa Barbara: ABC-CLIO Ltd, Publishers. pp. 374–375. ISBN 978-1610692793. ^ a b c Tordoff, William (1997). Government and Politics in Africa (Third ed.). Basingstoke: Palgrave-Macmillan. pp. 97–98. ISBN 978-0333694749. ^ W. James, Martin (2004). Historical Dictionary of Angola. Rowman & Littlefield. pp. 161–162. ISBN 978-1538111239. ^ "How southern Africa is coping with worst global food crisis for 25 years". The Guardian. http://theguardian.com/global-development/2016/may/22/southern-africa-worst-global-food-crisis-25-years. "Drought is affecting 1.4 million people across seven of Angola’s 18 provinces. Food prices have rocketed and acute malnutrition rates have doubled, with more than 95,000 children affected. Food insecurity is expected to worsen from July to the end of the year." ^ "CIA – The World Factbook – Country Comparison :: Area". United States Central Intelligence Agency. https://www.cia.gov/library/publications/the-world-factbook/rankorder/2147rank.html. Retrieved 13 July 2014. ^ "Cabinda". Global Security. Archived from the original on 8 July 2014. http://www.globalsecurity.org/military/world/war/cabinda.htm. ^ Mulenga, Henry Mubanga (1999). Southern African climate anomalies, summer rainfall and the Angola low. PhD Dissertation. University of Cape Town. OCLC 85939351. ^ (2008) "Equatorial African climate teleconnections". Theoretical and Applied Climatology 95 (3–4): 407–416. DOI:10.1007/s00704-008-0018-4. ^ "Angola". US Department of State. https://www.state.gov/outofdate/bgn/angola/19488.htm. Retrieved 22 November 2016. ^ a b c d "CIA – The World Factbook". United States Central Intelligence Agency. https://www.cia.gov/library/publications/the-world-factbook/geos/ao.html. ^ Péclard, Didier (ed.) (2008) L'Angola dans la paix: Autoritarisme et reconversions, special issue of Politique africains (Paris), p. 110. ^ a b c "Angola". Freedom in the World 2014. Freedom House. https://freedomhouse.org/report/freedom-world/2014/angola. Retrieved 7 February 2015. ^ "Ibrahim Index of African Governance". Mo Ibrahim Foundation. http://www.moibrahimfoundation.org/iiag/. Retrieved 9 August 2014. ^ Miranda, Jorge (2010) "A Constituição de Angola de 2010", O Direito (Lisbon), vol. 142. ^ Amundsen, Inge (2011). Angola Party Politics: Into the African Trend (PDF). Chr. Michelsen Institute (CMI) and Centro de Estudos e Investigação Científica (CEIC). ^ Angolan Leader Dos Santos to Step Down After 38 Years in Power. Bloomberg (3 February 2017). Retrieved on 26 April 2017. ^ En Angola, le ministre de la Défense devrait succèder au président Dos Santos. Lefigaro.fr. Retrieved on 26 April 2017. ^ "Angola : une purge au sein de la Sonangol emporte Isabel dos Santos" (in fr-FR). BENIN WEB TV. 15 November 2017. https://beninwebtv.com/2017/11/angola-purge-sein-de-sonangol-emporte-isabel-santos/. Retrieved 21 November 2017. ^ "Angola's Lourenco replaces police and intelligence chiefs". Reuters. 20 November 2017. https://www.reuters.com/article/us-angola-police/angolas-lourenco-replaces-police-and-intelligence-chiefs-idUSKBN1DK1SH. Retrieved 21 November 2017. ^ "Angola sacks Africa's richest woman" (in en-GB). BBC News (British Broadcasting Corporation). 15 November 2017. https://www.bbc.com/news/world-africa-42003016. Retrieved 21 November 2017. ^ "LGBT relationships are illegal in 74 countries, research finds". The Independent. 17 May 2016. https://www.independent.co.uk/news/world/gay-lesbian-bisexual-relationships-illegal-in-74-countries-a7033666.html. ^ Hartman, Ben (30 April 2010). "Was diplomat denied post in Angola because he is openly gay?". Jpost.com. http://www.jpost.com/Israel/Article.aspx?id=174356. ^ "Resultados Resultados Definitivos do Recenseamento Geral da População e da Habitação de Angola 2014" (PDF). Instituto Nacional de Estatística. March 2016. p. 27. Archived from the original on 6 May 2016. https://web.archive.org/web/20160506013702/http://aiangola.com/wp-content/uploads/2016/03/Publica%C3%A7%C3%A3o-Resultados-Definitivos-Censo-Geral-2014_Vers%C3%A3o-22032016_DEFINITIVA-18H17.pdf. ^ "Angola profile". BBC News. 22 December 2013. https://www.bbc.co.uk/news/world-africa-13036732. ^ Angola Financial Sector Profile: MFW4A – Making Finance Work for Africa. MFW4A. Retrieved 9 August 2013. ^ "The Increasing Importance of African Oil". Power and Interest Report. 20 March 2006. Archived on 5 May 2006. Error: If you specify |archivedate=, you must also specify |archiveurl=. http://www.pinr.com/report.php?ac=view_report&report_id=460. ^ Luanda, capital of Angola, retains title of world's most expensive for expats. The Daily Telegraph. Retrieved 9 August 2013. ^ "Marching towards riches and democracy?" The Economist. 30 August 2008. p. 46. ^ "Angola: Country Admitted As Opec Member". Angola Press Agency. 14 December 2006. http://allafrica.com/stories/200612140990.html. ^ "Angolan Diamond Centenary Conference 2013 Highlights Endiama and Alrosa Joint Venture for Future Geological Exploration of diamond deposits of Angola’s Territory". Press release. angolancentenary.com. Archived from the original on 14 November 2013. https://web.archive.org/web/20131114012955/http://www.angolancentenary.com/press6.pdf. Retrieved 13 July 2014. ^ Anti-corruption watchdog Transparency International rates Angola one of the 10 most corrupt countries in the world. ^ Dolan, Kerry A. (23 January 2013). "Isabel Dos Santos, Daughter Of Angola's President, Is Africa's First Woman Billionaire". Forbes. ^ This process is well analyzed by authors like Christine Messiant, Tony Hodges and others. For an eloquent illustration, see the Angolan magazine Infra-Estruturas África 7/2010. ^ Udelsmann Rodrigues, Cristina (2006) O Trabalho Dignifica o Homem: Estratégias de Sobrevivência em Luanda, Lisbon: Colibri. ^ As an excellent illustration see Luanda: A vida na cidade dos extremos, in: Visão, 11 November 2010. ^ Alt, Robert. "Into Africa: China's Grab for Influence and Oil". Heritage.org. http://www.heritage.org/research/africa/HL1006.CFM. Retrieved 27 June 2010. ^ "Angola’s Political and Economic Development". http://www.cfr.org/world/angolas-political-economic-development/p16820. ^ "Angola: Explain Missing Government Funds". Human Rights Watch. 20 December 2011. https://www.hrw.org/news/2011/12/20/angola-explain-missing-government-funds. Retrieved 22 December 2011. ^ Redvers, Louise POVERTY-ANGOLA: Inter Press Service News Agency – NGOs Sceptical of Govt's Rural Development Plans Script error. ^ Manuel Alves da Rocha (2010) Desigualdades e assimetrias regionais em Angola: Os factores da competitividade territorial, Luanda: Centro de Estudos e Investigação Científica da Universidade Católica de Angola. ^ "Sectores Económicos Prioritários" (in Portuguese). ANIP. http://www.anip.co.ao/index.php?pag=conteudos&id=6. ^ "Angola Cables e parceiros estrangeiros anunciam construção de cabo submarino" (in Portuguese). ANGOP. 14 October 2014. http://www.portalangop.co.ao/angola/pt_pt/noticias/economia/2014/9/42/Angola-Cables-parceiros-estrangeiros-anunciam-construcao-cabo-submarino,db62f448-710d-4cc5-80c5-fcee32a1a991.html. ^ Machado, André (30 January 2014). "Cabo submarino que ligará Brasil à África terá capacidade de 40 terabits por segundo" (in Portuguese). O Globo. http://oglobo.globo.com/sociedade/tecnologia/cabo-submarino-que-ligara-brasil-africa-tera-capacidade-de-40-terabits-por-segundo-11456022. ^ Inácio, Adelina (12 March 2015). "Nação está mais ligada" (in Portuguese). Jornal de Angola. http://jornaldeangola.sapo.ao/politica/nacao_esta_mais_ligada. ^ "Angola has about 14 million mobile phone network users – Minister". ANGOP. 12 March 2015. http://www.portalangop.co.ao/angola/en_us/noticias/economia/2015/2/11/Angola-has-about-million-mobile-phone-network-users-Minister,2053f698-ce71-4ed2-9910-cd5819ad539d.html. ^ "Angola com crescimento anual superior a 55% no sector das TIC" (in Portuguese). Platina Line. 12 March 2015. http://www.platinaline.com/index.php/component/k2/item/14117-angola-com-crescimento-anual-superior-a-55-no-sector-das-tic. ^ "Sector das TIC com crescimento anual superior a 55 por cento na última década" (in Portuguese). Ver Angola. 13 March 2015. http://www.verangola.net/Artigos/Sector-das-TIC-com-crescimento-anual-superior-a-55-por-cento-na-ultima-decada=005331. ^ "Lançamento de satélite angolano volta a ser adiado, agora para 2017". http://br.sputniknews.com/portuguese.ruvr.ru/news/2014_04_12/Lan-amento-de-sat-lite-angolano-volta-a-ser-adiado-agora-para-2017-1109/. Retrieved 19 November 2015. ^ "Conclusion works of "Angosat" project set for 2016". ANGOP. 8 September 2014. http://www.portalangop.co.ao/angola/en_us/noticias/ciencia-e-tecnologia/2014/8/37/Conclusion-works-Angosat-project-set-for-2016,580015f8-0b1f-46b1-b6b1-ebfd1beb5253.html. ^ Agência Lusa (4 November 2014). "Primeiro satélite angolano pronto para ser lançado em 2016" (in Portuguese). Observador. http://observador.pt/2014/11/04/primeiro-satelite-angolano-pronto-para-ser-lancado-em-2016/. ^ "Table 2. Total population by country, 1950, 2000, 2015, 2025 and 2050 (medium-variant)". (PDF). United Nations Department of Economic and Social Affairs/Population Division. p. 27. ^ "Angola". CIA World Factbook. ^ As no reliable census data exist at this stage (2011), all these numbers are rough estimates only, subject to adjustments and updates. ^ World Refugee Survey 2008 – Angola Script error, UNHCR. NB: This figure is highly doubtful, as it makes no clear distinction between migrant workers, refugees and immigrants. ^ "José Eduardo dos Santos diz que trabalhadores portugueses são bem-vindos em Angola". Observatório da Emigração. http://www.observatorioemigracao.secomunidades.pt/np4/3607.html. Retrieved 22 July 2013. "…presença de cerca de 200 mil trabalhadores portugueses no país…"
^ "Angola: Cerca de 259.000 chineses vivem atualmente no país". Visão. 25 April 2012. http://visao.sapo.pt/angola-cerca-de-259000-chineses-vivem-atualmente-no-pais=f660830. Retrieved 13 January 2013. ^ Bender, Gerald (1974). "Whites in Angola on the Eve of Independence. The Politics of Numbers". Africa Today 21 (4): 23–27. ^ Flight from Angola, The Economist , 16 August 1975 puts the number at 500,000, but this is an estimate lacking appropriate sources. ^ Siza, Rita (6 June 2013). "José Eduardo dos Santos diz que trabalhadores portugueses são bem-vindos em Angola". Público (Lisbon). http://www.publico.pt/economia/noticia/jose-eduardo-dos-santos-diz-que-trabalhadores-portugueses-sao-bem-vindos-em-angola-1596693. ^ "Angola, Brazil: A culture shock divide · Global Voices". 17 August 2008. https://globalvoices.org/2008/08/17/angola-brazil-a-culture-shock-divide/. ^ "Angola: português é falado por 71,15% de angolanos". Archived from the original on 26 December 2016. https://web.archive.org/web/20161226100353/http://aiangola.com/wp-content/uploads/2016/03/Publica%C3%A7%C3%A3o-Resultados-Definitivos-Censo-Geral-2014_Vers%C3%A3o-22032016_DEFINITIVA-18H17.pdf. Retrieved 10 January 2017. ^ "Angola". State.gov. 19 September 2008. https://www.state.gov/j/drl/rls/irf/2008/108352.htm. Retrieved 13 July 2014. ^ Oyebade, Adebayo O. Culture And Customs of Angola, 2006. Pages 45–46. ^ "ANGOLA 2012 INTERNATIONAL RELIGIOUS FREEDOM REPORT". state.gov. https://www.state.gov/documents/organization/208328.pdf. ^ Angola: Religious Freedom Profile at the Association of Religion Data Archives Brian J Grim and Roger Finke. "International Religion Indexes: Government Regulation, Government Favoritism and Social Regulation of Religion". Interdisciplinary Journal of Research on Religion. 2 (2006) Article 1: www.religjournal.com. ^ "International Religious Freedom Report – Angola". U.S. Department of State. 1 January 2004. https://www.state.gov/g/drl/rls/irf/2001/5511.htm. Retrieved 27 June 2010. ^ Culture and customs of Angola. Westport, Connecticut: Greenwood Press. 2007. p. 40. ISBN 978-0-313-33147-3. https://books.google.com/?id=DeVqVy21g9sC&pg=PA40. ^ "International Grants 2005" (PDF). Archived from the original on 13 November 2008. https://web.archive.org/web/20081113131805/http://www.pcusa.org/hunger/downloads/2005intgrants.pdf. Retrieved 27 June 2010. ^ Seal, AJ (January 2007). "Low and deficient niacin status and pellagra are endemic in postwar Angola". Am. J. Clin. Nutr. 85 (1): 218–24. PMID 17209199. ^ "WHO: Yellow fever outbreak is 'serious and of great concern'". http://edition.cnn.com/2016/05/19/health/yellow-fever-who/index.html#. ^ a b c d e f g h i j k l "Botswana". 2005 Findings on the Worst Forms of Child Labor. Bureau of International Labor Affairs, U.S. Department of Labor (2006). This article incorporates text from this source, which is in the public domain. ^ "National adult literacy rates (15+), youth literacy rates (15–24) and elderly literacy rates (65+)". UNESCO Institute for Statistics. http://stats.uis.unesco.org/unesco/TableViewer/tableView.aspx?ReportId=210. ^ "Angola – Statistics". UNICEF. Archived from the original on 13 June 2010. http://www.unicef.org/infobycountry/angola_statistics.html. Retrieved 27 June 2010. ^ Poncianinho, Mestre; Almeida, Ponciano (2007). Capoeira: The Essential Guide to Mastering the Art. New Holland Publishers. pp. 18–. ISBN 978-1-84537-761-8. https://books.google.com/books?id=fKKGUCJ5PAwC&pg=PA18. "Angola". Encyclopaedia Britannica. 2 (9th ed.). 1878. p. 45. Chisholm, Hugh, ed (1911). "Angola". Encyclopædia Britannica. 2 (11th ed.). Cambridge University Press. pp. 38–40. Much of the material in this article comes from the CIA World Factbook 2000 and the 2003 U.S. Department of State website. The information given there is, however, corrected and updated on the basis of the other sources indicated. Wikivoyage has a travel guide for Angola. Angola from UCB Libraries GovPubs. Angola profile from the BBC News. Key Development Forecasts for Angola from International Futures. Markus Weimer, "The Peace Dividend: Analysis of a Decade of Angolan Indicators, 2002–2012". 1 Part of São Tomé and Príncipe from 1753. 2 Part of Portuguese Guinea from 1879.